In wood research, light and fluorescence microscopy is an indispensable tool. Researchers at the WKI determine, for example, the quality of the bonding of composite materials and analyze fibrous materials and wood foams. Furthermore, the scientists perform damage analyses on, amongst other items, adhesives and coatings, and investigate historical materials. The scientists will be presenting the spectrum of different samples under the microscope. For the “light” floorboards made from recycled balsa wood from wind-turbine rotor blades, which are also being displayed on the stand, the researchers will present the intimate bonding of the two fibers thereby utilized. As a contrast to this completely new product, the scientists will also be placing extremely old materials under the lens. In the open-cast mine in Schöningen, 300,000-year-old wooden spears were discovered. Wood from the area surrounding the spears exhibits a unique state of preservation for this age. Although the cell walls have predominantly been severely damaged by bacteria, some largely intact cells can still indeed be seen. There is no standard method for making the invisible visible. For each new assignment from widely differing industries, the experts have to decide on the suitability of the numerous microscopic methods and the type of preparation. 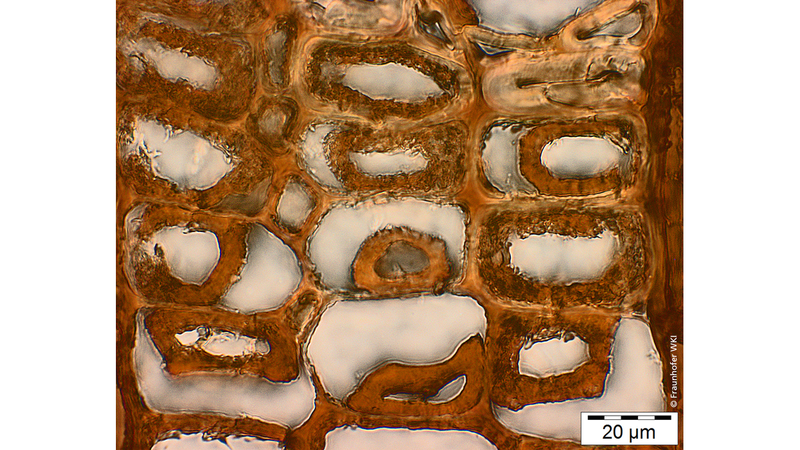 With reflected-light microscopy, for example, the surfaces are sanded using a grain size as high as 3000. Even very fragile or very hard materials can be prepared within minutes therewith. Fluorescence microscopy is a very suitable method for reflected-light microscopy. Specialists thereby use the effect that many substances alter the wavelength of the incident light (UV or other wavelengths). In this way, many structures can be detected which would otherwise remain undiscovered with conventional light microscopy. Through special coloration methods, which the researchers are constantly further developing, individual chemical components can be highlighted.